How big would a comet have to be, to be able to collide with the sun? The basic answer to this question is simple: any size of comet – or any other object floating around in space – can end up colliding with the Sun. A lot of comets manage to avoid this because they’re in a stable orbit around the Sun, much like we are on Earth: but they tend to have elliptical orbits, so to us they seem to be coming and going at random times. If it’s heading straight at the Sun it’ll definitely collide, but if it’s heading off to one side and going fast enough that the Sun’s powerful gravity can’t pull it in, it’ll make it past. The heavier the comet is, the faster it’ll have to go to escape the Sun’s gravitational pull. However, what’s also interesting to think about is how big a comet would have to be to actually make a noticeable difference to what the Sun is up to – to change its speed of rotation, or force it to move. 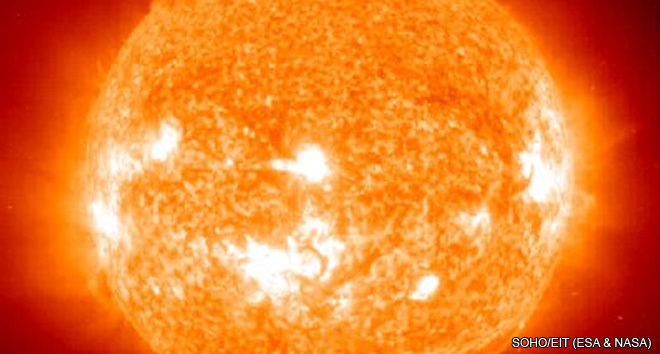 Even the smallest collision has a tiny effect on the Sun’s momentum and spin, but most are so tiny in comparison to the Sun’s mass that you could never notice or measure them. Watch out: here comes some maths! Thinking about the Sun’s movement, then: momentum is the mass of an object multiplied by its velocity (speed in a certain direction). 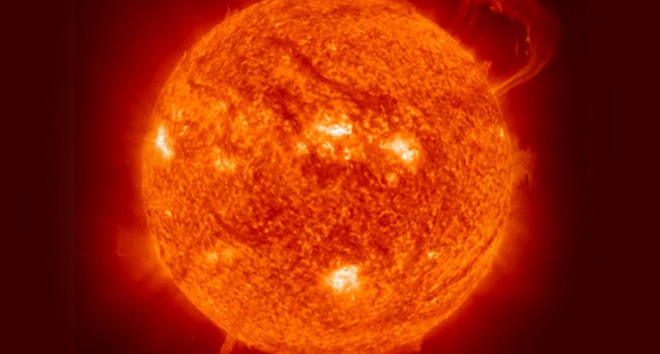 The Sun’s mass is a whopping 2 x 1030 kg, or 2,000,000,000,000,000,000,000,000,000,000 kg. It also orbits the centre of our galaxy, the Milky Way, at a velocity of 200 kilometres a second (45,000 miles an hour). Together they make an epic momentum of 4 x 1035 kg m/s. Let’s take an example of a comet that travels very close to the Sun: comet ISON. 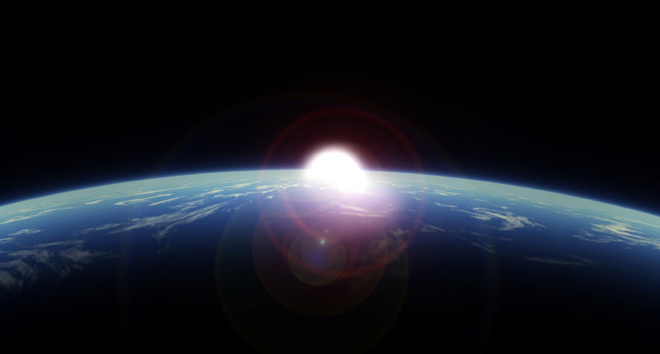 When it reaches its peak speed as it swings around the Sun, it reaches a phenomenal speed of 360 kilometers a second. Its mass is around 2 quadrillion kilograms (2,000,000,000,000 kg). So all in all, it’s going about twice the speed of the Sun, but with only 1 sextillionth (that’s 1 x 1018) of the Sun’s mass behind it in the fight. So in the overall battle, the Sun’s momentum would only change in a head-on collision by 2 sextillionths – not very much. If the comet was to be big enough to change the momentum of the Sun by, say, one-hundredth, it would need to be either 2 nonillion kg (that’s 2 followed by nine sets of three zeros, or 2 x 1027), going at a speed of 1 quintillion metres a second, or somewhere in the middle of both. For reference, Earth weighs 6 x 1024 kg, so the massive comet would have to be a million times bigger than Earth; the speed of light is 300,000,000 metres per second, and as far as we know now, it’s not possible to go any faster. Any comet that was big enough to make a large difference to the Sun’s momentum, then, would have to have a huge mass, far bigger than even our own planet. It would likely have to be another star, or a planet as big as Jupiter – and I think we probably wouldn’t survive the collision to see it happen! Great article. Although when you say “quadrillion”, according to wikipedia it should have 15 zeros. 12 zeros would be trillion. “The heavier the comet is, the faster it’ll have to go to escape the Sun’s gravitational pull.”..is this correct? 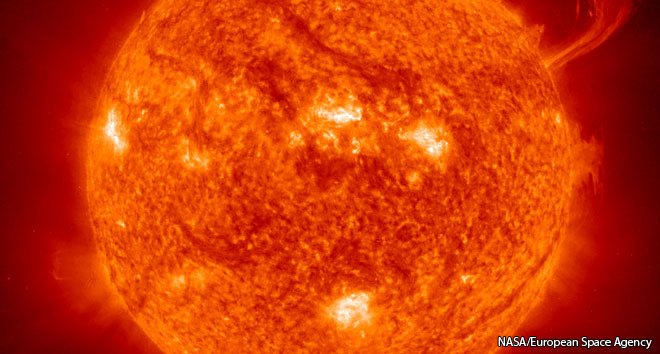 How do we know how old the Earth, Sun and universe are? 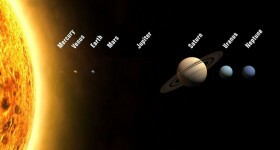 How far is the Sun from Earth? How many years are left before the sun dies? 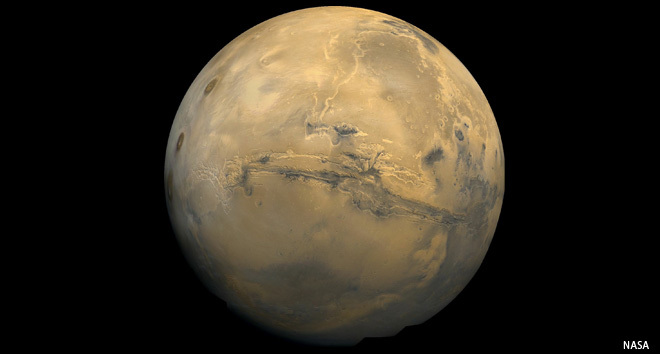 What is the distance between Earth and Mars?